Confocal immunofluorescent analysis of HeLa cells using ORC2 (3G6) Rat mAb #4736 detected with Anti-rat IgG (H+L), (Alexa Fluor® 647 Conjugate) (blue) and COX IV (3E11) Rabbit mAb #4850 detected with Anti-rabbit IgG (H+L), F(ab')2 Fragment (Alexa Fluor® 488 Conjugate) #4412 (green). 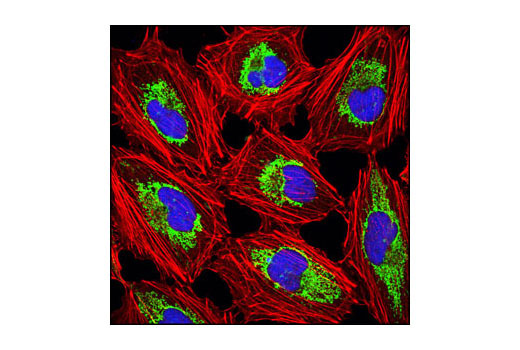 Actin filaments have been labeled with DY-554 phalloidin (red). Flow cytometric analysis of untreated HeLa cells using HSP70 (6B3) Rat mAb #4873 detected with Anti-rat IgG (H+L), (Alexa Fluor® 647 Conjugate) (green) and compared to a nonspecific negative control antibody (red). The optimal dilution of the anti-species antibody should be determined for each primary antibody by titration. However, a final dilution of 1:500 - 1:2000 should yield acceptable results for immunofluorescent and flow cytometry assays. 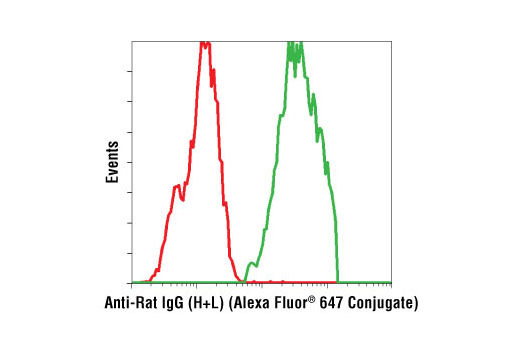 Anti-rat IgG (H+L) was conjugated to Alexa Fluor® 647 fluorescent dye under optimal conditions and formulated at 2 mg/ml. IgG is prepared from goat antibodies that have been adsorbed against mouse IgG, mouse serum and human serum.